I do so love old highways, especially those that have become byways, bereft of their numbers. How much people miss by not taking just a bit more time along the way! As mentioned in earlier postings, I grew up just off the former Lincoln Highway–the original 1913 route–in northern Indiana, very near to an early roadside landmark still standing (albeit changed some), the old Bob’s Corner, which stood on the north side of the Lincoln Highway at the junction of what later became two major highways, US20 and State Road 2. Decades ago the junction, always dangerous, was moved a good ways east and proper traffic lights added, leaving the abandoned stretches of 20 and 2–the Lincoln Highway–to become Oak Knoll Road. My family and I continued to use the old way, shaving off a good mile or so and avoiding the traffic light to and from LaPorte. But I digress, which, of course, is the whole point of taking old roads. The Lincoln Highway, a coast-to-coast route from New York to San Francisco, was the ambitious dream of Indianapolis entrepreneur Carl Fisher, a man known for his grand visions. (Among other things, he and his partners founded the Indianapolis Motor Speedway and later, Miami Beach.) In 1913 Fisher, long a promoter of automobiles, formed the Lincoln Highway Association. The plan, audacious for its day (long before numbered routes), was for a clearly marked improved road across the nation. By 1915 the route was complete, if not the actual improved roads. A film of the entire length of the Lincoln Highway was made and shown at the Panama Pacific International Exposition in San Francisco that year. The route of the original Lincoln Highway roughly (very, in several places) follows old US30, that is, except in Indiana, where the original 1913 route swoops northward to catch Goshen, Elkhart, South Bend, and LaPorte. The revised 1928 route through Indiana did indeed follow mostly what is today old US30 through towns such as Warsaw and Plymouth. Both routes became part of the Indiana state byway system last year. Ohio’s portion of the Lincoln Highway in all its variant routes is part of a similar system. Of course I’ve been all over Indiana’s routes, and over time and numerous trips, I had covered virtually all the spiderweb of routes of the Lincoln Highway in Ohio as well, except for the easternmost counties beyond Massillon, where, as in many Indiana towns, the main street is called Lincolnway. In earlier posts I mentioned some of the joys of the route from Van Wert, not far from the Indiana line, eastward through Wooster, home to a fabulous Hungarian pastry shop and Books in Stock, a shop in which to lose yourself for hours. I longed to see that last stretch of the Lincoln Highway that threads through Canton and beyond enters a wonderland of foothills, agricultural delights, and forgotten little towns. And I had wanted to explore further the city of Mansfield, home to the Kingwood gardens (read about it here Home), a wonderful accidental discovery during one of those earlier Lincoln Highway diversions. The first time I saw this it was late in the year and so there was no admission charge. 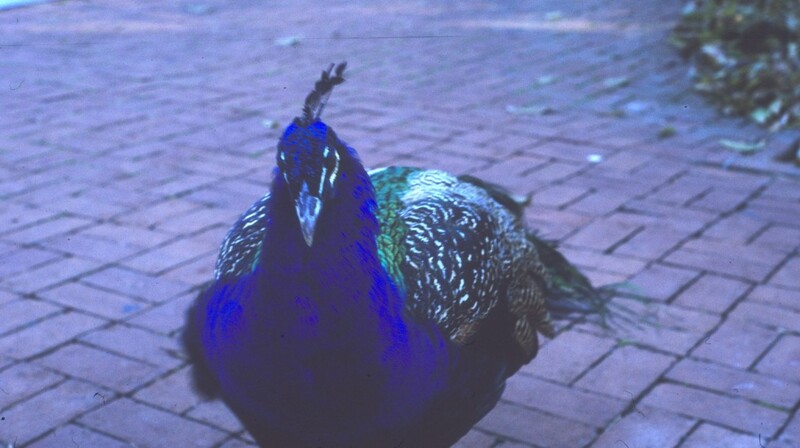 Endless gardens–not to mention hungry peacocks! On its northeast side Mansfield also boasts the massive architectural wonder, the Ohio State Reformatory (Experience One of Our Nation’s Most Historic Treasures – Mansfield Reformatory Preservation Society) dating to the 1880s. The city’s downtown, smack on the original Lincoln Highway, boasts many wonderful buildings and some interesting revitalization efforts. But I also had a yen to return to an old tourist attraction that my family visited before I was five: Ohio Caverns, which was the kernel of another recent post (http://gloryjune.com/wordpress/?p=118 ). The cave is northeast of Dayton amidst rolling farmland, so I planned a route incorporating the old National Road (US40, mostly) into Ohio, then northeastward to Ohio Caverns, and then continuing up to meet the Lincoln Highway at Bucyrus with a night stop in Wooster and breakfast the next morning at Tulipan Hungarian Pastry and Coffee Shop, good plan! Starting eastward from Bucyrus, a county seat town (famous for its bratwurst!) on the Sandusky River, we watched for all those roadside artifacts that spoke of the Lincoln Highway’s heyday, such as the occasional road marker or something more esoteric, like this barely visible abandoned drive-in theater on the 1928 route via Crestline. 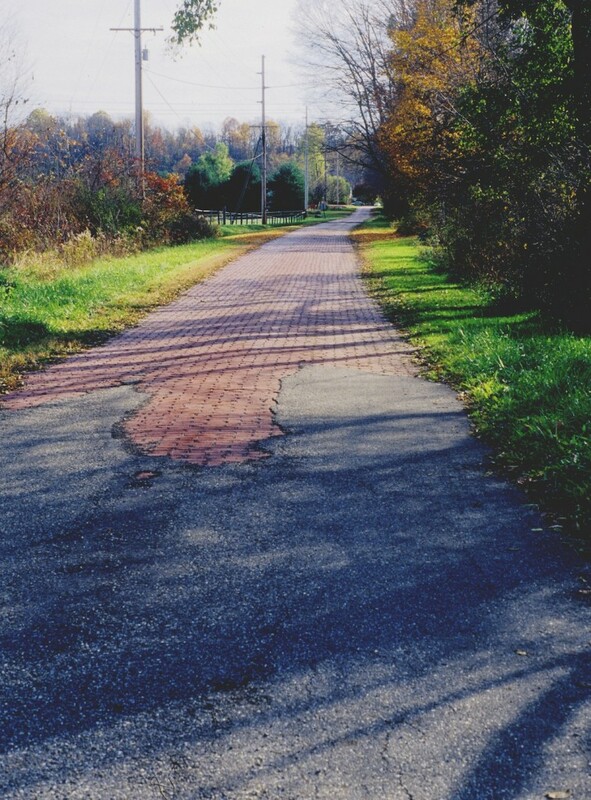 Much like Indiana and Illinois–and no doubt most of the other states this historic route traverses–Ohio’s Lincoln Highway diverges into multiple roads as the routes were refined over time or a town clamored to be included. (Few part ways as much as the two main routes of Indiana’s section of the Highway, however.) Earlier variations of the Lincoln Highway between Bucyrus and Mansfield wound through Galion, and it is a pleasant alternate route worth taking. Most of the time what was once an old highway that has lost its official status is fairly obvious to me. These roads shout out their former import in the way they are laid out, their width, and as I mentioned, evidence along the roadside, both glaring and subtle. 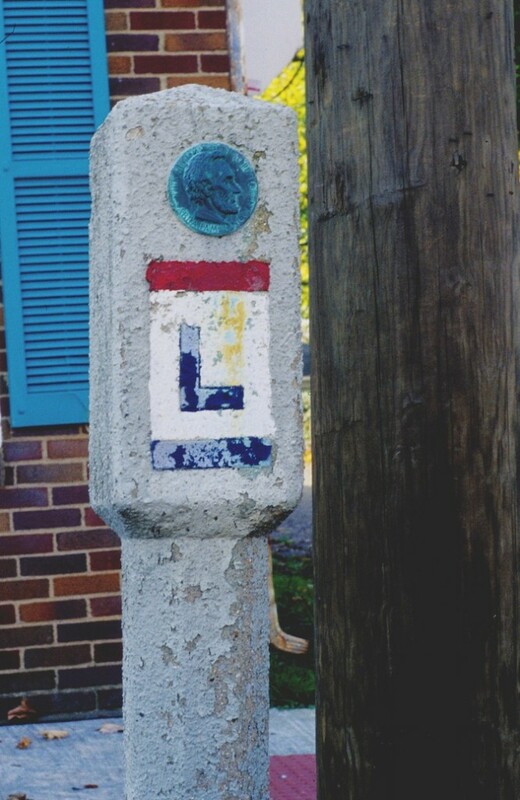 There might be the occasional Lincoln Highway pillar–a few do survive–or a barely visible remnant of a roadside park. The architecture may suggest the heyday of the highway. I rarely listen to the radio or converse with my fellow traveler in the midst of these excursions, preferring instead to hear the road’s song. It never grows old, although it is timeless. The route through Crestline takes one into Mansfield north of the main drag but eventually goes to Park Avenue, passing the afore-mentioned Kingwood Gardens. We decided to stop and see the peacocks, who evidently remembered that we’d fed them in the past. After threading through Mansfield, the Lincoln Highway to Wooster is a very pretty stretch, as I’ve mentioned in previous posts, winding through woods and farms and little towns like Mifflin and Hayesville. We stopped to eat at the Oak Park Tavern, a roadside supper club near Mifflin dating to 1940 (read about it here: Oak Park Tavern ) and spent the night in Wooster. The next morning, fortified with a wonderful breakfast of rolled omelets at Tulipan ( Tulipan Pastry and Coffee Shop ) and armed with a couple of Hungarian open-faced sandwiches for the road, we set off toward Massillon and the unknown Lincoln Highway beyond. I was delighted to discover another Twistee Treat (mentioned in an earlier blog http://gloryjune.com/wordpress/?p=92) on the east side of Massillon. Two within a few miles on my favorite highway! Cool! These ice cream cone buildings are wonderful examples of mimetic roadside architecture and evoke a much earlier era than when they were actually built. In the once-industrial city of Canton, probably known best as the home of the Pro Football Hall of Fame, the Lincoln Highway is Tuscarawas Street, the main drag, which boasts a number of architectural gems. But beyond this urban diversion, adventure beckoned, and it was easy to feel the wonder of the early road. In the days before road maps, how did an intrepid automobile traveler find his way? The Lincoln Highway, as did others, offered guidebooks that relied heavily on landmarks and mileage. A compass would have been useful, too. But also there were concrete markers placed at intervals. Here is one of several that survive in Ohio, this one about five miles east of Canton. This was only one of a seemingly endless stream of early road artifacts in this section of the highway, which grows ever more hilly as one travels east. The road laughed and so did I at the joy of discovery. Numerous old, mostly former, 1950s-era motels appeared; there were more concrete markers, and most intriguing of all, several short abandoned segments of the original highway, paved with brick and wide enough for a Model T. Bumping along these, time travel becomes real. The charming town of Lisbon, the Columbiana County seat, was worth a brief stop to admire the courthouse and other interesting 19th century buildings. 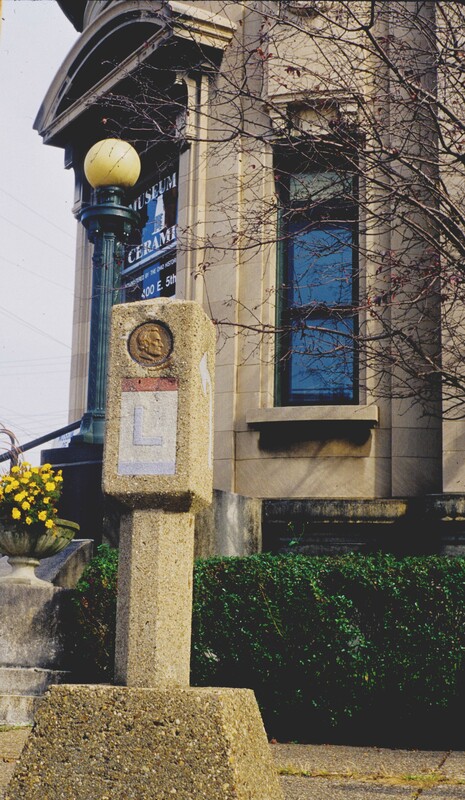 Ohio’s portion of the Lincoln Highway ends sixteen miles farther on in East Liverpool, situated along the fabled Ohio River across from West Virginia. Here once thrived an immense ceramics industry, fed by the wonderful clay found in this region. Almost all the scores of factories are gone now, and the two that I knew best (given my fondness for 1930s kitchenware), Hall and Homer Laughlin, have merged. But the story is still told in the Museum of Ceramics, housed in the city’s glorious former post office built in 1909. It is a fascinating place, displaying examples of all the pottery and china that was once made in the area (read more about it here: http://www.themuseumofceramics.org/index.html ). Lifesize dioramas illustrate the manufacturing process. The museum gets little funding, but boasts a dedicated and very knowledgeable staff. Listed in the National Register of Historic Places, the building, hardly a block from the river, stands on the highway that was created four years later, with a concrete marker in front of the entrance to prove it. Not terribly far from it is the Hall/Homer Laughlin factory outlet, at the site of the Hall factory; the Homer Laughlin factory, home of Fiesta ware, lies just across the river in West Virginia. Tours are possible, but for another day. East Liverpool deserves more exploration as well. Always something to call me back! On my way to somewhere else in Ohio, there was something I wanted to see again, an old tourist attraction in which my daddy had carried me around when I was a toddler, so my mom always told me. I have no memory of it; but indeed, a faded old photo survives from that visit to Ohio Caverns. I’d always had a yen to go back and actually see it. Now, since I later became an avid caver and knew something about karst, a geological landscape conducive to caves, I had assumed Ohio Caverns was in southern Ohio somewhere. But no, it turns out the cave is in a most unlikely location northeast of Dayton amidst rolling farmland. Fun with geology! Seeing that, I planned a route incorporating the old National Road (US40, mostly) into Ohio, then northeastward to Ohio Caverns and onward from there. Of course, the journey IS the way. Ohio Caverns is one of those timeless attractions. The entrance to the property is essentially the same since it was erected in the 1930s; the cave, of course, has survived decades of tourists and is as mysteriously beautiful as ever. On a lovely fall day we were the only people there for a tour at that time, so we had the caverns to ourselves. Ah. It had been too many years since I’d been deep into a cave. The current entrance and passage through the caverns was created in 1925 and takes one through a fairyland (indeed, old brochures marketed the site as “Nature’s Fairyland.”), enhanced with direct and indirect lighting. Owing to a variety of mineral deposits, the Ohio Caverns are especially colorful. The guide pointed out a narrow passage off the main trail that had once been open to the public in the early twentieth century, shortly after the cave was discovered in 1897. Access to it was from the original opening, and with advance notice, one could arrange a tour. But this year (2012), the “historic tour” has been opened up and is offered regularly. I can never check places off my list; there is always a reason to return! I was so taken with caves in my youth that after a visit to the granddaddy of them all, Mammoth Cave, I saw myself as a cave guide or some such. I produced an exhibit on cave geology for the school science fair and wrote a paper on the history of Mammoth Cave for my English class. But although I did not pursue a career in speleology, when I was in college I went on wild caving expeditions (also called “spelunking” by people who don’t actually do it), led by my geography professor, in whose earth science classes I excelled. What adventures we had! I continued for some years after to go caving in southern Indiana and even in the coral-based caves of Florida (painful for crawling!) But this does not make commercial caves any less appealing to me. The cave wars and especially the death of Floyd Collins strengthened the growing movement to make Mammoth Cave a national park, which happened in the 1940s. Subsequent cave explorations have shown that most of the caves in this area are linked in one vast underground system. 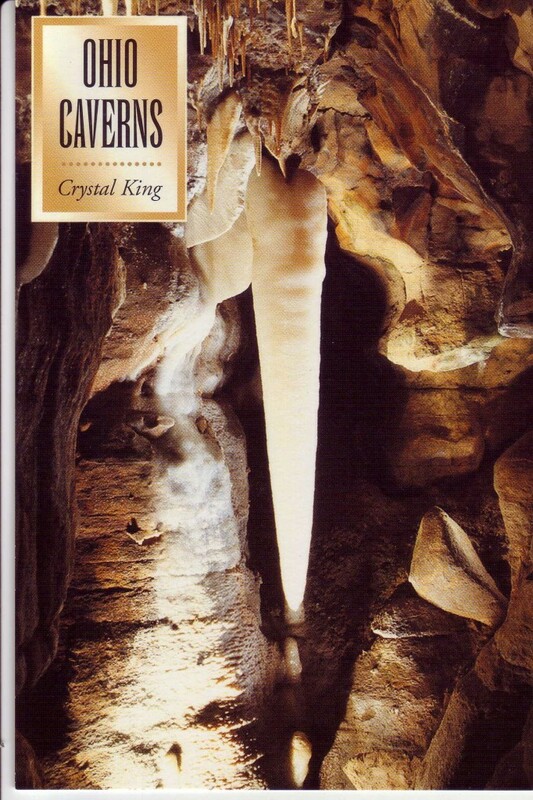 A connection between Mammoth Cave and the Flint Ridge caves was discovered in 1972, detailed in the book The Longest Cave by Roger W. Brucker and Richard A. Watson. Too much drama! The Ohio Caverns, lacking such a grisly history, are as beautiful as any I have ever seen, with more formations packed within its confines than many larger caves. And the countryside surrounding it is so peaceful, with no hint of the beauties beneath it. I am eager to return to experience the “historic tour.” Besides, nearby West Liberty boasts other sites of interest, including the over-the-top Piatt Castles (http://www.piattcastles.org/piattcastles/Home.html), which have been open for tours for one hundred years (!) and, of course, Marie’s Candies (http://www.mariescandies.com/), a mere 56 years old, famous for its chocolates. I hear the road calling to me! I’ve just returned from what has become in less than a decade one of our most cherished Christmas traditions, one that encompasses nostalgia, bittersweet memories, a road trip, and history. It was a visit to Frankfort, population 16,500 or thereabouts, seat of Clinton County, Indiana. 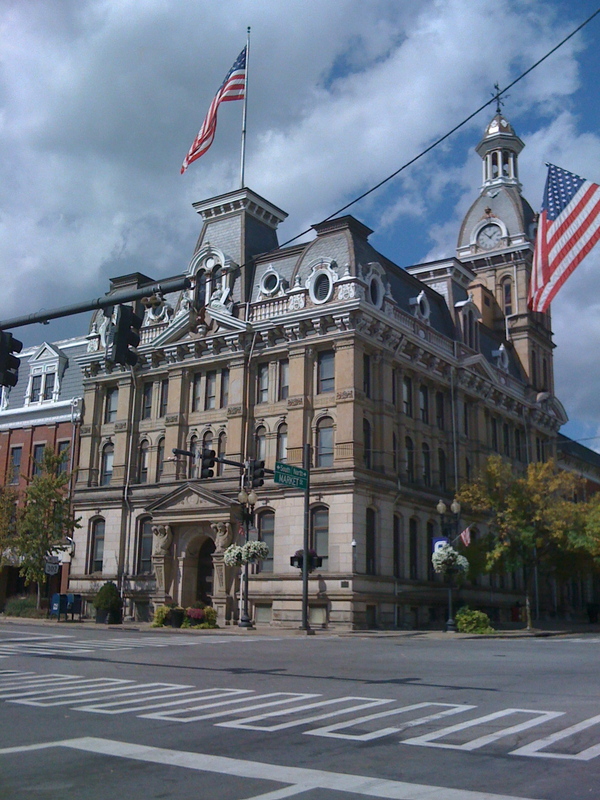 Founded in 1830, Frankfort (named in honor of the Frankfurt in Germany) boasts an impressive 1882 courthouse–and a high school whose athletic teams are the Hot Dogs. 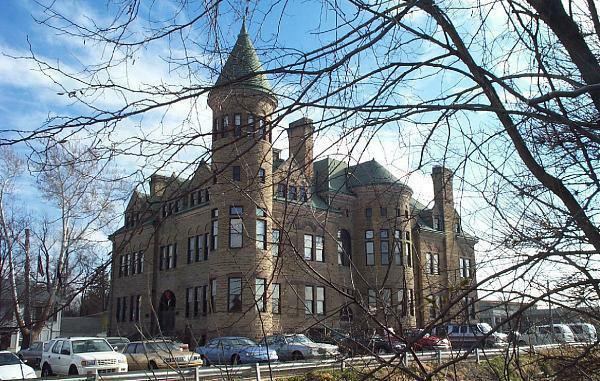 The city government is now housed in the once-endangered old high school, fondly known as “Old Stoney,” a massive Romanesque Revival edifice constructed in 1892. The county historical society’s museum occupies the second floor. The park, dedicated one hundred years ago, is a gem, laden with history, several examples of New Deal construction by the WPA and NYA, a petting zoo and aviary, and an intriguing little former fountain by sculptor Jon Magnus Jonson. Every December, however, the park undergoes a magical transformation into a Christmas fairyland. Let me say that I have always loved the lights of Christmas. There were not that many in the rural community in which I grew up, save for a huge fir across from the elementary school that a group of homeowners in the area always strung with hundreds of lights. Going into town (South Bend or LaPorte) and seeing the many colored lights on houses and in trees at Christmas time was a joy. Later on, traveling through the lonely December landscape after a visit to my mother, I was always heartened by the occasional brave displays on isolated farmhouses and especially cheered when going through small towns. When she came down to visit me at Christmas, we often drove around to the fancy neighborhoods to ooh and aah. (This was before the computer-generated, music-coordinated flashdance travesties one sometimes sees today.) Later still, my mother, a former WAVE in World War II, moved into the Indiana Veterans Home in West Lafayette. I visited her weekly and when December came, took her for drives to see the lights. As Mom’s health worsened and the visits became more painful, I sometimes took alternative routes home to clear my mind. It was on one such meander that I passed through Frankfort and caught sight in the distance of Christmas lights in TPA Park. As drawn to it as the proverbial moth, I was astonished at the wonderland this little town had created. It was just what I needed. Happily, I was able to take Mom to see this vision before she was unable to get out at all. It was so incredible, all the more since Frankfort is such a small city. And they do it every year. It is difficult to convey the scope of this effort: eighty-five acres filled with over a million lights! All the buildings are transformed; one–at least by night–becomes a crystalline castle. Throughout the park the trees are all strung with various colors; it is a fantasyland, and I am a child again and yet old as time. The displays are amusing or sweet, and many are animated. (I especially like the dancing Hot Dog at the park entrance.) The Twelve Days of Christmas are each illustrated with appropriate figures (the four calling birds sit on telephones); Santa appears in numerous fanciful tableaux, and one may drive beneath a gigantic holly wreath arch or through a lovely tunnel of lights. Of course, there is a manger scene. A Star of Bethlehem shines over all. The electric bill is astonishing. Created mostly with donations and volunteer labor (including Santa himself, passing out candy canes), the holiday display is maintained through New Year’s Day.. Within the park is a modest little coffee shop serving hot drinks, delicious soups and sandwiches–and the place was packed, filled with families and multiple generations of people, most of whom were smiling. Folks come in droves. We’ve gone in snow, when the sparkling lights are multiplied in the crystals, and in rain, which diffuses the colors into a dream. This time it was warm, and I had the window open to let in the wonder. I could feel Mom’s presence and all those Christmases past and all that is special about a small town–and something more. I’ve included no pictures; none could capture it. You’ll just have to see it for yourself. Recently I attended a convention in Massillon–always a pleasure, since the town, laden with wonderful architecture, sits smack on the Lincoln Highway and I usually manage to drive at least some of this wonderful road there and back. Having grown up just off the Lincoln Highway in Indiana between LaPorte and South Bend, where the main drags are–ahem–called “Lincolnway,” driving old highways is simply in my blood. (More on Indiana’s stretch, which has recently been designated a state scenic byway, another day.) In recent years, going to this particular convention has given me a good excuse to explore thoroughly our neighboring state’s stretch of this historic road. Van Wert is the first town of consequence, if you are following the Lincoln Highway eastward from Indiana. A county seat, it boasts an over-the-top nineteenth century courthouse and other wonderful downtown delights. In the next block from the courthouse is Balyeat’s (Balyeats Coffee Shop ). It has an incredible oversized neon sign decades old offering “young fried chicken,” which borders on the horrifying today, but is so darn cool! In truth we did not stop there on the way eastward, but did catch it on the way back, shortly before its closing on Sunday night. They’d had a big day and were out of a lot of food, but what they served–basic American homecooking fare–certainly made me want to go back another time. Besides, did I mention how cool the sign is? Balyeat’s atmosphere and location right across from that courthouse is the kind of place where you can imagine all the town’s moving and shaking has been going on–well, since 1924. Today I am writing primarily of food stops, although I must say the Lincoln Highway in Ohio is a joy to travel, with sweeping rural landscapes and intermittent hamlets and towns that the current US30 ignores, like Upper Sandusky and Bucyrus. But perhaps my favorite stop on the road to Massillon is Wooster. The Wayne County courthouse in Wooster is the only one I have seen in all my travels that is part of a city block, not set apart. (The Steuben County courthouse in Angola, Indiana sits in a corner of the square, but it is still a separate building.) This amazing Second Empire monument to excess was built 1877-79. My jaw still drops. This intersection lies north of a sort of square on which is located one of the most charming places to plot a revolution I’ve ever encountered. 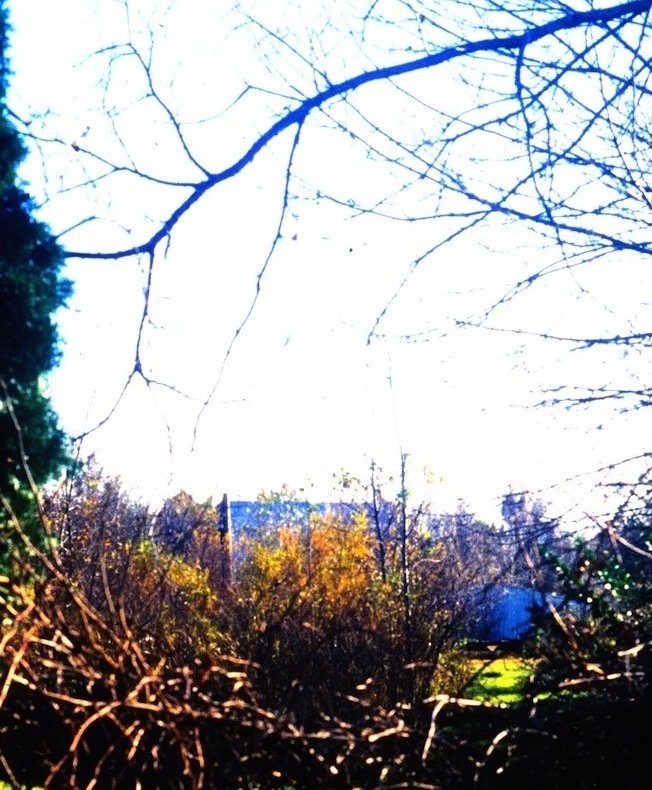 (And from its window one can gaze at the courthouse.) The Tulipan Hungarian Pastry & Coffee Shop is likely as close to Budapest as I’ll ever get. The pastries and Hungarian delicacies inspire rapturous praise. I have tasted nothing ordinary here, let alone bad. While the selections of pastries are vast, Tulipan also offers a menu of entrees that includes delicious open-face sandwiches and rolled omelets, something I had not ever seen before. Light, savory, and deceptively filling, I recommend them all. We stopped there for some pastry (it’s only 20-odd miles from Massillon) and kept to our plan of stopping there for lunch on the way home. The only problem is that it has such a wonderful feel about it that it is difficult to leave. Massillon, our destination and site of an annual classic film convention in the fall, is a wonderfully historic town, on a river and formerly on a canal, with all the above-ground archaeology associated with such a past. I had always passed and looked longingly at this interesting little drive-in on the west side of town, but this time finally stopped. It was a delightful surprise to discover it offered not only an array of ice cream treats, but a sizable food menu that included a variety of tasty sandwiches and salads. A little research after my return home revealed that there are a number of these buildings around the country, with several in Ohio. (Read about them here Twistee Treat). Ironically, I had happened to spot one in Niagara Falls earlier this year. Oh, so many wonders on Ohio’s Lincoln Highway! The return trip included that stop back in Wooster at Tulipan–and also a stolen hour at an amazing bookstore half a block away called Books in Stock (Books In Stock: Used, Rare and Antique Books) that is a dangerous place (you will never get away!) But there is one more food stop I must mention. The stretch of the old highway between Wooster and Mansfield is especially beautiful. Just east of Mansfield is the tiny village of Mifflin. Its main business is the Mifflin Lakes Trading Post, which is one of the few places you may hear someone order 3 dozen nightcrawlers and two scoops of chocolate ice cream. The storekeeper does wash thoroughly between orders. This place has a huge supply of every sort of bait and lure you could possibly imagine, along with hunting gear I’ve never dreamed of–and ice cream. Good ice cream, never mind the crickets. Old highways, as I said, are in my blood, and the Lincoln Highway never stops calling me. There is a stretch of the road in Ohio I’ve not yet seen, from Massillon to East Liverpool (home of all that wonderful pottery). I’m going back later this month. You can bet there will be a stop at Tulipan! 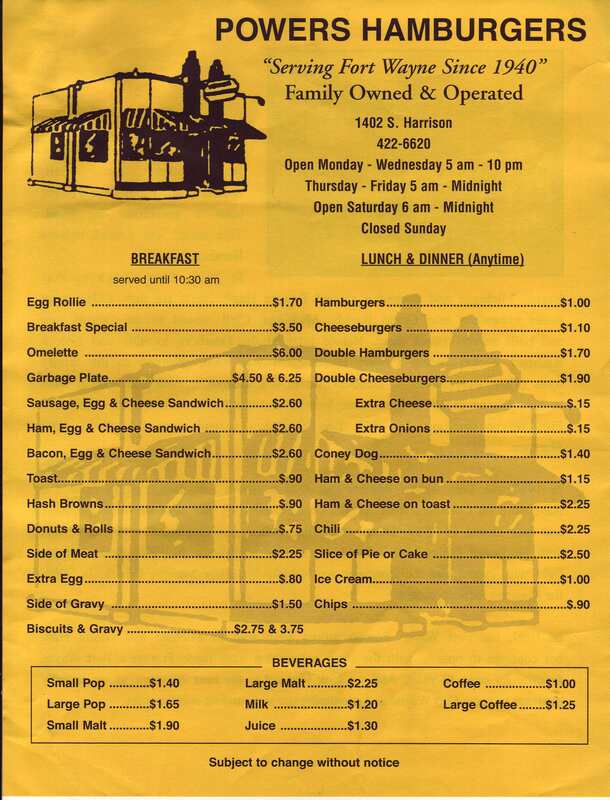 People are forever asking me “what’s a good place to eat in _______?” They assume that, since my work and wanderings take me all over the state of Indiana and beyond, I have amassed at least a mental list of favorite places. Well, I have, and I’m always on the lookout for more. Although I certainly am not averse to gourmet food and healthy fare, on the road my budget, time frame, and inclination tend to favor old-fashioned family-owned places. This weekend took me northeastward, where I attended the 58th annual reunion of CCC Company 556, the boys who built Pokagon State Park from 1934 to beginning of World War II. They deserve the attention of a separate article, which I’ll be posting soon. The first foodstop was Powers Hamburgers in Fort Wayne, located in a great little late Art Deco building on Harrison Street downtown. Now, you would rightly assume that chains are normally off my list, but small localized chains may qualify. Powers actually began in the mid-30s in southeastern Michigan, expanding to perhaps a couple dozen, building the first Fort Wayne restaurant in 1940. Ultimately there were three in Fort Wayne, including another Deco-ish one on the old Lincoln Highway, but this one is the sole survivor. (At least one of the Michigan stores survives in Port Huron, but it’s paired with a pizza joint.) It was the design of the building that first drew me in years ago. You might think that Powers is just another of those White Castle knockoffs that flourished in the 1930s-1950s, some of which are still around here and there, but you would be wrong. The Powers hamburger starts with a scoop of real ground meat, rather good meat, in fact, and is grilled on order. Each burger is smothered in freshly chopped onions. These are smallish–they’re served on large dinner rolls–but they are heftier than you might think. I recommend their malts. If you’re thinking of a sweet treat at the end of your meal to counter all those onions, Powers offers a variety of baked goods from the New Haven Bakery northeast of town (which I’ll be writing about soon in an article on great small town bakeries around the state). We left Powers with opened sinuses and satisfied tummies. I can even say that the Powers hamburger can be just what the doctor ordered. Some years ago, on my way back from a job a couple counties to the north, I was coming down with a severely painful sore throat that felt just as if I had swallowed ground glass. I stopped at Powers and the hot peppery burgers with all those onions made my throat feel much better. Of course it is true that onions have antiseptic qualities. Perhaps a Powers burger might be considered health food! Suppertime found us in beautiful Marshall, Michigan, sitting amidst the fireflies outside the Hi-Lite Cruz-In on the far east end of Michigan Street (formerly US112), well beyond the historic downtown. A large chunk of Marshall is designated a National Historic Landmark, most of which is mid and late nineteenth century. But the Hi-Lite opened in 1946, certainly historic in my book! It’s been expanded some over the years, and boasts a nice patio with several tables and chairs. Part of it is built around a huge glacial rock that evidently was just too big to move. Hi-Lite offers good drive-in food, much of it homemade, like their barbecues and delicious sloppy joes (miles above what we used to have in school! ), not to mention their wonderfully creamy root beer. This time I tried their homemade chicken salad with grapes and almonds, quite good! I recommend the thick onion rings, too. There is limited counter seating inside, and of course, curb service in your car. And yes, you can find them on Facebook. The final foodstop, a very late lunch the next day, was Clay’s Family Restaurant, teetering on the Indiana-Michigan border overlooking Lake George. It’s just a few miles north of Pokagon State Park on old US27. “A Steuben County tradition” since the late 1940s, Clay’s is simply my kind of place, loaded with charm and tasty traditional fare. They have a good soup and salad bar with two choices of homemade soup (the vegetable soup is so thick it is almost a stew!) and lots of fresh vegetables, along with some of the traditional favorites such as macaroni salad. The sandwiches and entrees are tasty and generous, but the pies–ah!–are not to be missed. 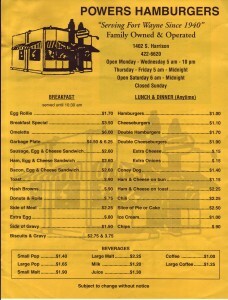 Their website (Clay’s Family Restaurant) boasts that “you’ll want to come back again and again!” And indeed I do.